Adjunct professors in the Dallas County Community College District do not have their own offices, benefits or guarantee that they will have a class to teach until the first day of class. Some said all of these factors can make it difficult to provide their students with the best education. Amber Pagel, a full-time English professor who at one point hired adjunct professors, said when a college doesn’t demonstrate that it values adjuncts by paying them what they’re worth they can feel unappreciated. “There’s certainly a trend toward more and more classes being covered by adjuncts and I think that trend is somewhat a result of the decreased funding that the federal, state and local governments have put toward community colleges,” said Pagel. Adjunct professors make up about 77 percent of faculty at Eastfield for fall 2018, according to numbers provided by Eastfield administration. In 2008, when the Southern Association of Colleges and Schools put Eastfield’s accreditation status on warning, 73.9 percent of Eastfield professors were adjuncts. SACS told Eastfield at the time that the number of adjuncts compared to full-time faculty was too high. Mike Walker, executive vice president of Eastfield, said he is not worried about adjunct numbers affecting accreditation because eight-week terms have caused them to hire more part-time professors to keep up with enrollment. He said that context will be important when SACS evaluates the college again this year. The quality of education is still high, Walker said. And adjuncts are a critical group at Eastfield, Walker said. As an adjunct for seven years before he landed his first full-time job, he said he understands how difficult it can be. He said the quality of adjuncts at Eastfield shouldn’t be overlooked, either. “Adjuncts are critical to our college and every other college,” Walker said. In the DCCCD, adjunct professors are allowed to teach three three-credit classes per semester at $2,324 per class. If the professor is teaching three classes at Eastfield, they have to be one 16-week class, one first-term eight-week class and one second-term eight-week class. Walker said the limit on classes is due to a state law. 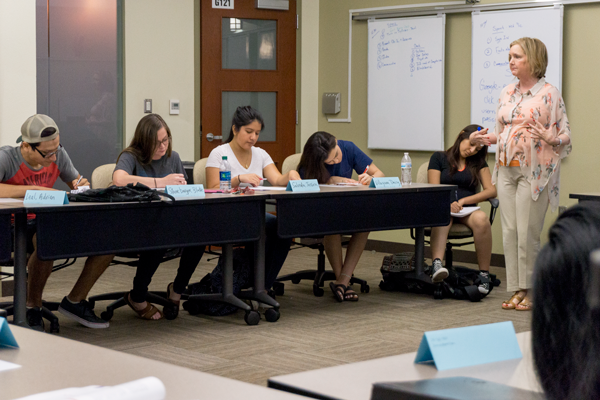 The pay per class and limit of how many classes professors can teach mean that many are left piecing together a career across multiple colleges, including Tarrant County College and Collin College. Collin College allows part-time associate professors, the equivalent of adjunct faculty, to teach up to nine contact hours a week, paid $2,664 per three credit hours for the average lecture class. Part-time associate professors can teach up to three credit hours a term, coming to a maximum income of $7,992. Tarrant County College also allows nine contact hours per week for adjuncts, with pay starting at $40.56 per contact hour. TCC pays up to 144 contact hours a term, amounting to a maximum of $5,840.64. While adjunct compensation has been an issue of national debate for years now, it gained more traction in recent months. The Chronicle of Higher Education explored New School history professor Claire B. Potter’s suggestion that all adjuncts with doctorates quit their teaching jobs and go into the industry to force education institutions to offer better compensation. “If people refuse this labor and did something else with the Ph.D.s [SIC] — which according to studies done by professional associations is more than viable — institutions would be forced to adjust their hiring practices,” Potter argued in a Facebook post, according to the Chronicle of Higher Education in May. The New York Times reported April 5 that labor unions are stepping up to fight for adjunct compensation and many professors across the U.S., adjunct and full-time alike, are demanding a change. Sometimes, these conditions push adjunct faculty to leave the profession. Professor Sam Jubran left adjunct teaching to become a speech therapist but returned to teaching. Jubran, an adjunct professor for six years, said teaching is what challenges and fulfills her the most in life. Jubran said adjunct teaching is a stretch on time and to do it, you have to learn to manage time carefully and be efficient by not lecturing on issues that aren’t going to affect the student’s learning. According to the American Association of University Professors, more than 50 percent of professors today are part-time without a chance to receive tenure. The AAUP says on their website that while some part-time professor positions are filled with specialists or current practitioners in their fields teaching on the side, they are an exception rather than a rule. In 2015, the National Center for Education Statistics found that 48 percent of faculty were part-time. Professor Ralph Hendrickson, an adjunct professor for 13 years, has been on a search for a full-time position since he began. He said he knew the nature of the job very well when he chose it and understood it may be difficult to transition into full-time. “When I took this job I knew what the pay was, I knew there were no benefits and I still took the job,” Hendrickson said. He said he did that because of his passion for teaching. Adjunct professors operate by teaching on a limited work contract, which means they are offered or not offered a contract on a semester-to-semester basis, which are subject to cancellation up to the very first day of class. Full-time professors are required to teach at least five classes in the spring and five classes in the fall. If not enough students sign up for a full-time professor’s class, then a class is taken from an adjunct professor and given to a full-time professor. Hendrickson said he’s had his classes cut down because of low enrollment. In some cases he has been left waiting until the last minute to find out if his class section will make. “It might be the weekend before classes start because generally they wait because they’re waiting for kids to sign up,” Hendrickson said. For wages to become more competitive, it would take part-time faculty walking off the job in protest, Hendrickson said, but he thinks that’s unlikely because they like what they do too much. “I’d rather be part-time here at Eastfield than be a full-time teacher in Dallas with benefits and more pay because I like this,” he said. He argued that colleges don’t have motivation to hire more full-time faculty because adjuncts bring the same passion and quality for a lower cost to the institution. Compared to full-time faculty members, adjuncts receive no benefits and have lower wages while having the same instructional responsibilities as other full-time faculty, such as assembling syllabi, ordering textbooks, and writing lectures. English professor Emily Sallee said if her spouse did not have a job with benefits, she wouldn’t be able to get by. She used to teach at both Eastfield and Tarrant County College, but now only teaches at Eastfield. She said she would have to work three to four jobs just to scrape enough money together to pay the bills. She knows other adjuncts that are not as lucky as she is. Different textbooks, different requirements and just overall different courses can make it difficult for adjuncts to juggle jobs at different institutions, Sallee said. Travel time and scheduling office hours don’t make it any easier, and that still doesn’t take in account the time required to grade student work, give feedback or plan lectures. Whether they are full-time or adjunct, professors are required to attend meetings, training and other out-of-class events. Sallee said she doesn’t know how she would manage everything without electronic communication like email. Pagel said that because adjuncts aren’t given an office and therefore are not required to have office hours, the amount of time they can give to students and the quality of the education they can give, no matter how good of a teacher they are, could be compromised by the situation. Full-time faculty are required to have office hours in their schedule, a time set aside for students to visit their professor and talk about concerns in the class, ask questions or discuss material. Sallee said adjuncts as a whole are not as recognized and appreciated as they should be. Pagel believes the consequences on our student population can also get very complicated because developmental programs and training are a problem. She said if adjuncts want to improve as teachers, they have to do it for free. “If the district isn’t paying them for professional development or making it worth that time then how well are those professors going to teach those eight-week classes? … Are the students going to suffer from the professors’ lacking their training?” Pagel said. The lack of pay for prep time can make the job more difficult, especially when balancing eight-week terms and traditional 16-week semesters across campuses, Sallee said. There is hope for adjuncts dreaming of a full-time gig, Walker said. With Eastfield’s enrollment on a steady increase and eight-week classes adding more class sections, Eastfield will need to hire more full-time professors in the coming years to keep up with student demand for classes.